All Syzygy Acoustics’ subwoofers make subwoofing easier by addressing two major problems. First, they eliminate the need for unsightly and expensive interconnect cables, and second, they automatically equalize their output to your room. Syzygy also includes a neat app for your smartphone that serves as a comprehensive remote control. Syzygy solves the connection problem by using a proprietary wireless link. You no longer have to run an interconnect cable to wherever you decide to place your sub; you can put it anywhere without tripping over wires. (Make that almost anywhere. You can’t place it behind furniture; apparently, that blocks the wireless signal.) A power cable is still required. Room equalization is a harder nut to crack, but Syzygy solves that even more brilliantly by providing an iPhone/iPad app that purportedly EQs the sub for your room with the push of a button. How does the Syzygy app accomplish this noteworthy feat? The company’s website says that “using unique SoundSculpt Technology, each Syzygy subwoofer essentially makes a 3-D sonic map of its space, and then adjusts its output to smooth out the aural peaks and valleys. It sends out a series of tones that measure the shape and size of your room, the position of the furniture, and how your decor absorbs and reflects sound. This rich acoustical data is captured by your smartphone and sent back to the subwoofer where it is corrected then perfected, ensuring that the sub-bass from the Syzygy subwoofer integrates seamlessly with your speakers and the low-frequency sound arrives at your ears at the correct time. All with a tap of an app.” That reminds me of another quote, from author Arthur C. Clarke: “Any sufficiently advanced technology is indistinguishable from magic.” Whether it’s magic or technology, if it works, I like it. Maybe now they’ll figure out a way to automate setting up a tonearm. Why is that so hard? Or a wireless power connection for something more demanding than a smart watch—that should make someone rich. The $999 SLF870 subwoofer tops Syzygy’s line of four subs. 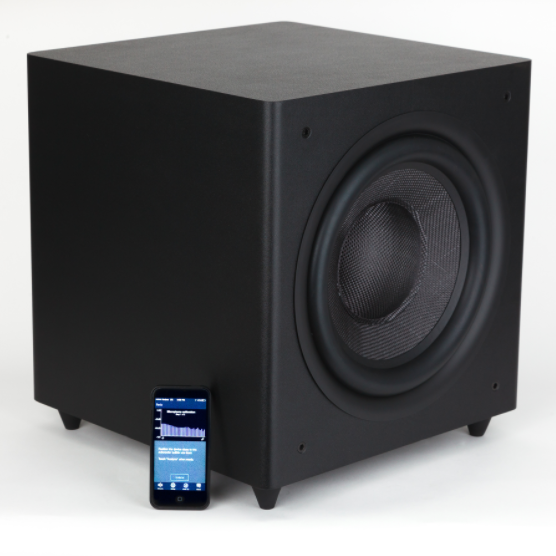 Housed in a 15" cube, the driver uses a 12" proprietary woven-cellulose-fiber diaphragm (pretty fancy for a subwoofer at this price point) driven by a 1200-watt BASH amplifier. The sealed enclosures are acoustic-suspension designs, which use the air trapped inside them as the spring to restore the cones to their equilibrium position. Compared to a ported enclosure, a sealed system is more linear and has better transient response, but is less sensitive, since it doesn’t use the output from the back of the cone. But with 1200 watts of amplifier power, sensitivity is not a problem. Depending on where you screw on the feet, you can aim the driver forward or downward. The SLF870 is rather plain to look at, but since you probably won’t want to look at it, that shouldn’t matter. Its rubber feet are less fancy than the metal spikes found on most expensive subwoofers, but I appreciated the protection they afforded my hardwood floors. (They also provide proper spacing from the floor if you orient the drivers facing down.) You can swap the rubber feet out for spikes as a later upgrade. To connect the SLF870 to your system, you couple a wireless transmitter to your preamp or integrated via RCA unbalanced cables. The transmitter is a 3½" x 3½" x 1¼" black fuzzy box, with two RCA input jacks and a jack for a wall-wart power supply. One transmitter can communicate with and control up to eight subwoofers wirelessly via the subs’ built-in receivers. If for some reason you actually like interconnect cables, you can use them instead of the wireless connection, though that seems like buying a Ferrari and signaling for turns by using hand gestures—a simile that’s probably wasted on younger readers. Compared to most subwoofers, the back panel of the SLF870 is very spare, comprising an RCA jack and some status lights. That’s because all its controls are on the smartphone app. Weighing just less than 40 pounds, the SLF870 should be easy to place in your room. You can try it in different locations for maximum output, minimum intrusiveness, or best integration with your main speakers. The SLF870 uses a fixed 24dB/octave crossover. In my experience, a sharp crossover slope like that makes it easier to match the output of a subwoofer with a main speaker, keeping midrange frequencies out of the sub and the bass out of the speaker’s midrange driver. The crossover frequency is adjustable via the smartphone app. It’s very handy to be able to sit at your normal listening position and fine-tune how the SLF870 sounds.